Boston Red Sox's Mookie Betts, second from right, celebrates with Jackie Bradley Jr. and Sandy Leon after hitting a three-run home run off Tampa Bay Rays starting pitcher Jacob Faria during the third inning in St. Petersburg, Fla. , on Tuesday night. Rays catcher Wilson Ramos looks away. 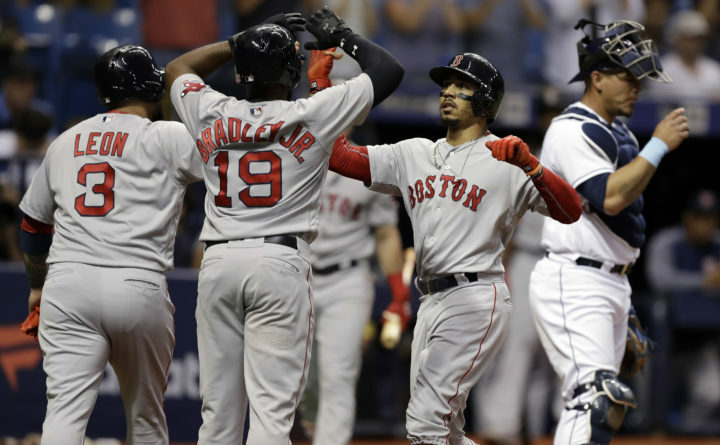 ST. PETERSBURG, Florida — Mookie Betts hit his major league-leading 16th homer, Chris Sale struck out nine in 7 2/3 innings and the Boston Red Sox beat the Tampa Bay Rays 4-2 on Tuesday night. Willy Adames made his big league debut and hit a solo home run off Sale in his second at-bat. The 22-year-old shortstop went 1 for 4 with three strikeouts. He was acquired from Detroit as part of a three-team trade that sent Rays ace — and current Sale teammate — David Price to the Tigers on July 31, 2014. Sale (5-1) gave up four hits and walked two. He has allowed three runs or fewer in his first 11 starts, the longest stretch by a Boston pitcher to open a season since Pedro Martinez’s 12 in 2001. Joe Kelly finished the eighth, and Craig Kimbrel got into a bases-loaded jam before getting his 14th save in 16 chances when Mallex Smith grounded into a game-ending forceout on Kimbrel’s 32nd pitch of the ninth. Jesus Sucre led off with a single, pinch-hitter Brad Miller doubled with two outs and Rob Refsynder walked. Two hitters following Faria’s departure, Wilson Ramos was taken out due to a bruised left hand after Pruitt’s 0-2 pitch to Xander Bogaerts bounced and struck the catcher. Daniel Robertson’s sacrifice fly pulled Tampa Bay to 3-2 in the fifth, and Rafael Devers hit a solo homer in the sixth. The announced attendance was 10,642, below the Rays’ AL-low home average of 14,711. Miami is last in the majors at 10,603. Red Sox: Asked whether 2B Dustin Pedroia (left knee surgery) could return Friday against Atlanta, manager Alex Cora said “it depends on how he reacts but he’s getting close.” Pedroia is on a rehab assignment with Triple-A Pawtucket. … RHP Hector Velazquez (lower back strain) could be back later this week. Adames took the roster spot of 2B Joey Wendle, who is on paternity leave for the birth of his son. … SS Adeiny Hechavarria (strained right hamstring) has not resumed on-field work. Price (4-4), coming off a complete game victory over Baltimore, goes against Rays RHP Chris Archer (3-3) on Wednesday night. “There will be a little bit of banter, but it’s all friendly,” Archer said.